In 2010 (265 showbettas by 26 European breeders), 2011 and 2012 (both 308 showbettas by 36 European breeders) the Holland Betta Show has been a big international success. Bettas4all.nl is proud to be invited for 21st edition of the Holland Koi Show to organize the Holland Betta Show 2013 in the beautiful Castle Gardens of Arcen, the Netherlands. The Holland Betta Show 2013 can be found in the fully acclamatized tent of the Holland Aquarium Show and is a unique opportunity for Bettas4all to introduce our beautiful hobby to the public. A dedicated team of experienced betta hobbyists will provide you with all the necessary information with respect to the keeping, breeding and showing of showbettas. At the show approximately 250-300 show Bettas of different color and finnage varieties will be shown. The fish will be judged on vitality, color, finnage, bodyshape and overall appearance by a team of experienced hobbyists according to the Bettas4all standard to determine the winners of the various showclasses and the special prices. It will also be possible for the visitors to purchase some quality fish for a reasonable price. Entry fee per fish: 2.50 euro. Maximum number of fish per breeder: 15*. * In case all 308 tanks are booked but more breeders would like to enter fish, the maximum number of entries per breeder could be reduced to maximally 10 fish in order to promote an even more interesting competition. • All participants will receive a 3-day entry ticket for the entire event (with a value of 40 euro). Benching of the fish takes place on Thursday 15th August 2013 between 14:00-18:00h. You can collect your fish again on Sunday 18th August 2013 at 18.00h. Payment of the entry fee has to be made when you bench your fish on Thurday 15th August 2013. Registration will open on the 1st of July 2013 and will close at the 12th of august 2013. We would like to invite you all for the 21st edition of the Holland Koi Show. We are looking forward to welcome you in the tent of the Holland Aquarium Show to come and see the Holland Betta Show for yourself. Please mark 16-18 August 2013 in your agenda! During the coming months our show website and this topic will be regularly updated to provide you with all the necessary information. En 2010 (265 showbettas par 26 éleveurs européens), 2011 et 2012 (à chaque fois 308 showbettas par 36 éleveurs européens) le Holland Betta Show a été un grand succès international. Bettas4all.nl est fier d'avoir été invité à la 21me édition du Holland Koi Show afin d'organiser le Holland Betta Show 2013 au coeur des magnifiques jardins Castle Gardens of Arcen, aux Pays-Bas. Le Holland Betta Show 2013 se situe sous le chapiteau climatisé du Holland Aquarium Show et est une occasion unique pour Bettas4all de présenter notre beau hobby au public. Une équipe expérimentée et dynamique vous fournira tous les renseignements nécessaires concernant la maintenance, la reproduction et les concours de Bettas. Le show présentera environ 250-300 Bettas de differentes couleurs et variétés de forme. Les poissons seront jugés par rapport à leur vitalité, couleur, nageoires, forme de corps ainsi que leur apparence générale par une équipe expérimentée, selon le standard Bettas4all standard afin de déterminer les gagnants des différentes catégories de concours et autres prix spéciaux. Les visiteurs aurant la possibilité d'acheter des poissons de qualité pour un prix raisonnable. Finance d'entrée par poisson: 2.50 euro. Nombre de poissons maximum par exposant: 15*. * Au cas où les 308 bacs seraient réservés, mais plus d'éleveurs désirent exposer des poissons, ce nombre maximum pourrait être réduit à 10, afin de promouvoir une competition encore plus intéressante.
! !Bonus spécial pour les participants!! • Tous les participants recevront un billet 3-day entry ticket pour l'exposition entière (d'une valeur de 40 euro). Mise en place des poissons jeudi 15 août 2013 de 15.00 à 20.00h. Vous pourrez récupérer vos poissons le dimanche 18 août 2013 à 18.00h. Le paiement de la finance d'inscription doit être fait lorsque vous installez vos poissons jeudi 15 août 2013. L'enregistrement des inscriptions sera ouvert dès le 1er juillet 2013 et sera fermé le 12 août 2013. Nous aimerions vous inviter tous à la 21me édition du Holland Koi Show. Nous nous réjouissons de vous souhaiter la bienvenue dans le chapiteau du Holland Aquarium Show afin de voir de vos propres yeux le Holland Betta Show. Marquez la date du 16 au 18 août 2013 dans vos agendas! 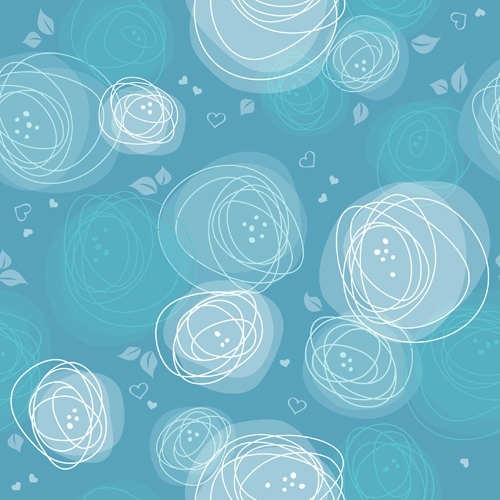 Pendant les mois à venir, ce topic ainsi que notre site web seront mis à jour régulièrement afin de vous fournir toutes les informations nécessaires. - All participants will receive a 3-day entry ticket for the entire event (with a value of 40 euro). Benching of the fish takes place on Thursday 15th August 2013 between 15.00-18.00h. You can collect your fish again on Sunday 18th August 2013 at 18.00h. 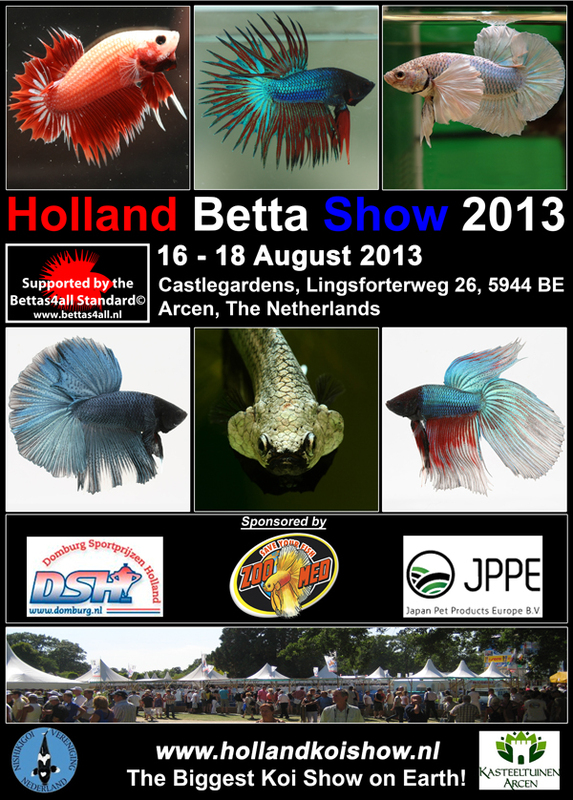 - 9:00-15:00h Build up Holland Betta Show by the Bettas4all Show Team + helpers. - 14:00-18:00h Benching of the fish by the participants. - 8:00h Start judging of the fish. - 9:30h Opening show location for the public! - 13:00h End judging of the fish. - 14:00h Start sales fish (with exception of the winning fish and only if offered for sale by their owner!). - 18:00h Show location closed for the public! We are happy to announce that the registration for the Holland Betta Show 2013 has officially opened! It is only necessary to enter the number of fish you would like to enter (maximum of 15 fish per participant), a more detailed description of your fish can be written down on the entry form at the benching procedure on Thursday the 15th of August. If necessary the members of the Bettas4all Show Team will be happy to assist you with this. Registration closes on the 12th of august 2013 or unless we have reached a maximum of 308 showbettas. If you have any question regarding participation or visiting the Holland Betta Show 2013, please do not hesitate to contact us. We hope to welcome you and your fish at the Holland Betta Show 2013. En cas de problème de compréhension de l'anglais, toute personne intéressée à participer peut me contacter par MP ! C'est là que l'on s'aperçoit que ce forum "jurabetta" ne souffre d'aucune forme de sectarisme et qu'il est ouvert aux autres Amis Bettaphiles. C'est bien pour cela que je l'aime notre Forum jurabetta. 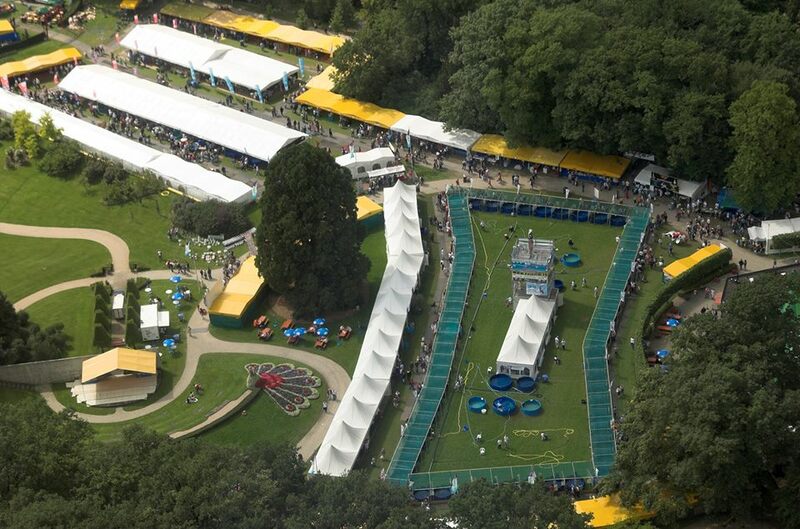 Three weeks from now, at the 16th of August 2013, the beautiful Castle Gardens of Arcen the Netherlands will open their doors for the 21st Holland Koi Show including the Holland Betta Show, Holland Shrimp Show and Holland Bonsai show. Joep nous rappelle que le Holland Betta Show, c'est dans 3 semaines, commençant le 16 août. Ce sera la 21me édition du Holland Koï Show, et il y aura non seulement des Bettas et des Koïs, mais aussi des Crevettes et des Bonsaïs ! Allez-y, vous ne serez pas déçus ! We are happy to inform you that the registration for the Holland Betta Show 2013 is now officially closed and that the show is fully booked! In total 308 show bettas have been registered by 36 breeders from 10 different European countries. More details can be found on the participating breeders and their country of origin can be found at the Bettas4all forum, please click here. Joep nous informe que les inscriptions sont clôturées pour le Holland Betta Show. 308 Bettas ont été inscrits par 36 éleveurs, provenant de 10 pays européens différents. Les détails peuvent être vus ici: CLIC !